It was almost exactly one year ago today that I started this blog so I guess this is my first anniversary post. I started the blog because I wanted to explore the relationship between classical American Philosophy and the teaching of Evolutionary Enlightenment which I have been involved with for 18 years. What I found was that Ralph Waldo Emerson’s Transcendentalism had many resemblances to Evolutionary Enlightenment and that the American Pragmatists, Charles Sanders Peirce, William James and John Dewey had developed between them a profound evolutionary philosophy. I have been both stunned and humbled to learn that so many ideas that I have devoted myself to and had thought were new actually had a long and rich history in American Philosophy. I also have had the benefit of outstanding comments from so many of my readers and have refined developed and even (gasp) altered my thinking all along the way. The path over the year was not exactly what I expected. We took a few long detours into very critical and important philosophical questions. One of these was the question of freewill vs. determinism. With the help of our friend Carl we were able to take a long look at this perennial philosophical question and to get help by drawing on Carl’s college professor B. F. Skinner a truly original and brilliant American thinker. I also took us on a related excursion into the possible limits of science and certain rigidities that can arise in scientific thinking. We also had many changes to explore the sweeping movements of history that have so much impact on how thought develops through time. For me the big revelation over this past year was seeing how Peirce, James and Dewey had constructed the beginnings of a comprehensive philosophy that attempted to explain the evolution of cosmos, consciousness and culture. Although the ideas of each of these thinkers includes some of each of these three elements, it is also true that they can fairly neatly be categorized based on the emphasis in their work as follows. Peirce emphasized an exploration of the cosmos. James emphasized the evolution of human consciousness. And Dewey emphasized the evolution of culture. Peirce was convinced that a fully encompassing theory of evolution would have to explain not only the evolution of life, but the evolution of the universe as a whole including the development of time and space, life and consciousness, and all of the natural and physical laws that currently exist. Peirce explained how the right combination of spontaneity, continuity and the tendency to form habits was enough to explain the evolution of everything else. James taught that the human experience of consciousness flows forward in ever emerging “drops” of awareness. He described “The Will to Believe” as the mechanism that controls the unfolding of our destiny. We each are free to chose what we believe in and what we believe in will determine the choices that we make and the future that we create. Dewey recognized that objects that are named always have as part of their meaning a sign that points toward some possible future. Objects such as these, that can be either physical or mental objects, make up culture, and the energy and activity of people that live in any particular culture will tend to flow in whatever direction the objects of that culture are pointing. Changing the objects in a culture becomes the mechanism through which culture can be changed. Together these three thinkers outlined the broad contours of an American Evolutionary Philosophy. Over the course of this year it seemed more and more obvious that the contemporary ideas contained in Integral Theory and Evolutionary Enlightenment have deep roots in the intellectual development of American Philosophy. So where do we go from here? With a year’s worth of foundation set I want to turn now to a more detailed look at just what Integral Theory and Evolutionary Enlightenment have inherited, directly and indirectly, from the great tradition of American Philosophy. 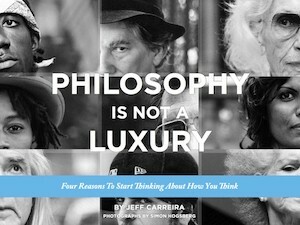 I remember your early blog: philosophy is not a luxury, and I think you proved that philosophy is about thinking deeply about the future and taking part in its conscious creation. Your blog made me so much more self-conscious: how much of my knowledge is autonomous and how much did I just consume, it challenged a lot of my ideas. I questioned what dó I actually know and how big is my interest to really find out what is true. What I like so much about evolutionary enlightenment/Integral theory is that it is as much interested in what is unknown (mystery) as scientist are, but that they have a much bigger perspective. It is all such a big mystery and I love studying it with you. I would like to thank you and other writers for continuing this blog the whole year with such a high frequency. It is the continuation that made my interest grow. It has made my perspective so much wider. I look very forward to the next year of investigation and the plans you have. Thank you. I have learned a great deal from the conversation on this blog over the year and look forward to more in the year to come. Well, it is a luxury to have the time and leisure to ponder these things that may not seem to have much bearing on the lives of those too occupied with 9-5 getting and spending. The more thinkers, philosophers and philosophy can be brought to the level where ordinary folk can relate to the musings to see their lives are affected, the more philosophy gains in pragmatic value. Philosophy can often seem coldly academic, IMO. Americans with our directness and way of speaking in plain American English, devoid of high-falutin language and stances, the better as far as getting philosophy heeded by just folks. The cold and removed element of philosophy in America was a later development that occurred with the professionalization and specialization of the discipline in the 20th century. During Emerson’s time philosophy was a more wide spread endeavor. In fact, Emerson himself was something of a pop-star in his time and both he and James wrote for a public audience. Part of what I would like to do is make a more public discourse about philosophy possible. I commend you for conducting this blog and it certainly is helpful in promoting more widespread popular discussions re: philosophy. Though intellectual and academic discussion and comments are worthy, I think blogging tends to encourage more plain talk, which I feel will be conducive to just plain folks getting into the discussions. New Dimensions radio show has a wonderful statement asserting that the personal and the planetary are connected. I’m trying to get the entire quote, if any have it pls share it here.